Birgit Jurock's Blog: Got Faith? Without faith, you will not experience success in any area of your life. FAITH is the Tool that must be utilized if you want to manifest your desires. You believe that you will succeed. 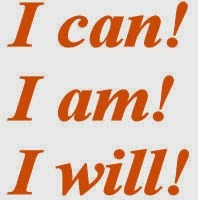 When you believe that you will achieve what you intend to accomplish, it will happen. Unfortunately, too many people have faith in the negative, they believe that something will go wrong. They attract the negative outcome. To turn this around one needs to change this mind set because the opposite of FAITH is FEAR. A belief is a thought that you think over and over again until you persuade yourself that it is true. Faith is not “hoping” that you succeed one day; neither is it wishing. Faith, is knowing that success is yours. Your faith (or initial belief) in the inevitable outcome will affect your actions. Your actions in turn will affect your results. Your results will in turn re-inforce your initial belief or faith. How does your faith look like?